Scotland has been named one of the top countries in the world to visit in 2014 by travel guide Lonely Planet. It was voted third best country to head to, behind Brazil which took the top spot and Antarctica which came second. 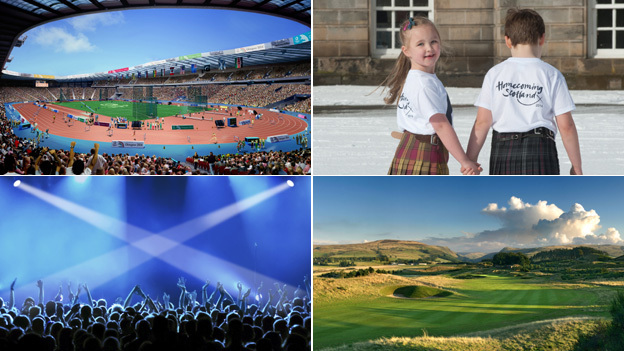 Lonely Planet said Scotland’s “jam-packed schedule of world-class events” made it “the place to be” in 2014. The Commonwealth Games take place in Glasgow next summer. The Ryder Cup will be held at Gleneagles and next year is also Scotland’s Year of Homecoming. The book also cited Highland Games and the Edinburgh festivals as events that will draw travellers to Scotland next year, and it said the country’s cities were well worth a visit. The guide described Edinburgh as “the most gothic city outside Transylvania” and encouraged travellers to “take the high road to Loch Lomond, Loch Ness and Cairngorms National Park and fall in love with the landscape that inspired poet Robert Burns”. Lonely Planet’s Best in Travel 2014 contributor Tom Hall said: “Next year Scotland will be well-deservedly taking the spotlight on the world stage. Mike Cantlay, chairman of VisitScotland, said: “It’s clear that 2014 is Scotland’s chance to shine on the world stage, and to have this commendation from Lonely Planet is a fantastic seal of approval. Lonely Planet said its Best in Travel annual is a collection of the world’s hottest trends, destinations and experiences for the year ahead. It highlighted the top ten countries, cities and regions to visit in 2014. Yorkshire came third in the list of top 10 world regions for 2014. The destinations featured in the book were selected because they meet certain criteria. Best valueAs host for the football World Cup, Brazil was the top country destination for 2014, with a visit to second placed Antarctica described as “a chance to take life on and follow in the path of other intrepid explorers”. Next year marks the centenary of the start of Ernest Shackleton’s infamous attempted Antarctic crossing. The Sikkim area of India was chosen as the best region to go to, with Paris the top city in a list that also included Cape Town, Shanghai and Chicago, while the Greek Islands were seen as the best-value destination. Best family travel spot was Denmark, while Cappadocia in Turkey with its “fairy chimney” landscape was the best honeymoon destination.